I really can't stand people that try to act "gansta". I have been trying for the gansta look with my bandana head gear when I am running. Maybe that is why so many critters disapprove of me? I dont even get it. 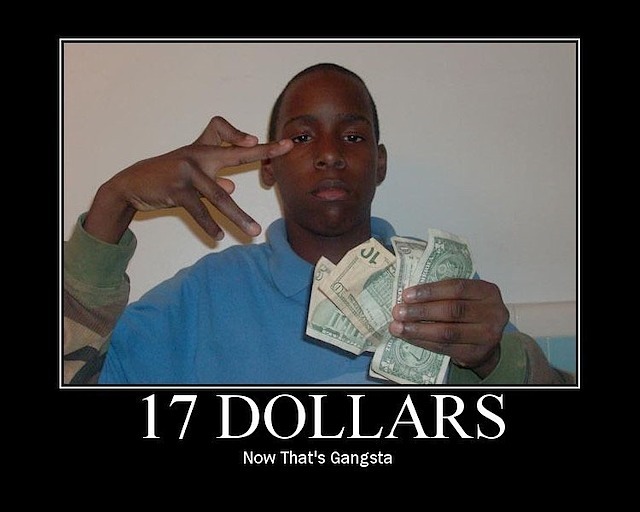 How is 17 dollars 'gangsta'? Can someone from 'da hood' enlighten me please? @ S1x Legi0ns: I think the idea of obtaining "lots" of money through illicit means (drug dealing and such) can be "gansta". The whole point of the Demotivational is to have an air of sarcasm. Yo, my scratcher came through, y'all.